The killer called himself "Sun." 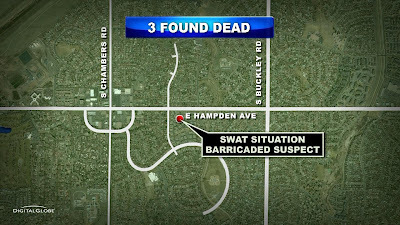 The second gunman to cause multiple fatalies in Aurora, Colorado in seven months has been identified by neighbors as 33-year-old Sonny Archuleta. 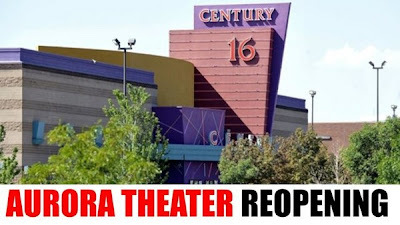 Aurora is also the location of the The Dark Knight Rises shootings on July 20, 2012. The surname Archuleta is a family name which was originated in the Basque Country of Spain. Archuleta is of Castillian derivation of Basque Aretxuloeta, which ultimately comes from the place name Arechavaleta (Basque: Aretxabaleta). The placename uses the Basque words "(h)aritz" (oak tree), "zabal" (wide) and "eta" (indicating plurality), with the combined meaning of "wide place where oak trees grow." The surname Archuleta as shown in the Diccionârio Onomastico y Heraldico Vasco (Basque heraldry dictionary) means oak grove. A published photograph of the killer who killed himself - Sonny Archuleta - shows he had a significant chest tattoo symbol of Superman. Source + Source. Man of Steel is an upcoming American superhero film directed by Zack Snyder, produced by Christopher Nolan (the director of the Dark Knight films) and scripted by David S. Goyer. It opens June 14th. Flag Day. Should we be worried? Please note that in back of Archuleta are photographs of the skyline and the Flatiron Building of New York City. New York City is the model for Gotham City in the Dark Knight/Batman mythos, and for Metropolis in the Superman stories. 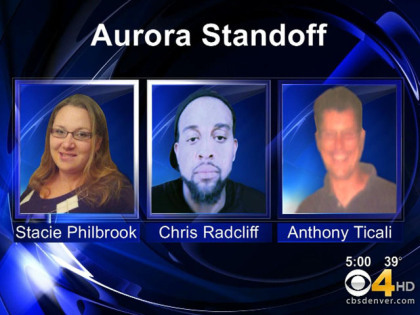 Aferrismoon notes that "Aurora police Sgt. 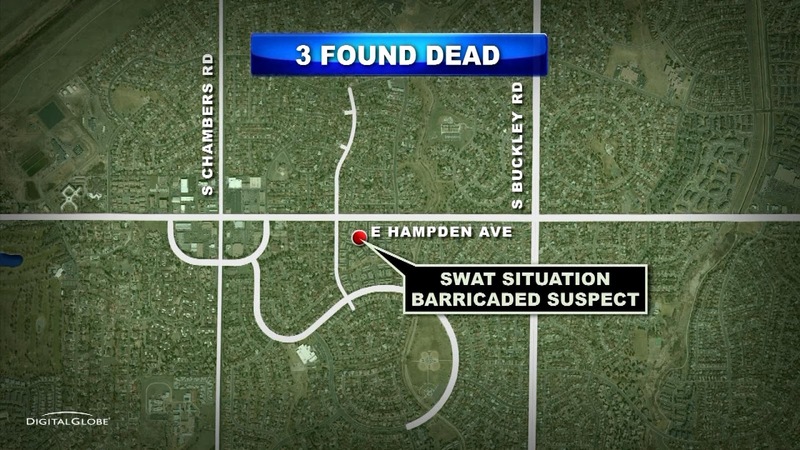 Cassidee Carlson spoke to the press at this incident, and also attended the search of James Holmes flat back in July." 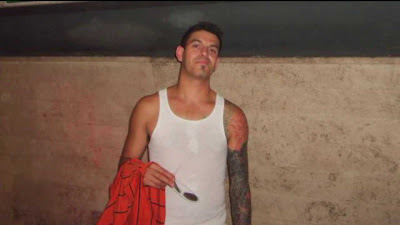 Sonny Archuleta's victims have been identified as Archuleta’s sister-in-law, Stacie Philbrook and her boyfriend, Chris Ratliffe; and Archuleta’s father-in-law, Anthony Ticali. On September 5, 2012, Archuleta tweeted about the murder of his brother, Pat, who was shot and killed at a local restaurant in Denver on September 3, 2012. It is mind-blowing that the alleged gunman in the first high profile mass shooting in Aurora Colorado since the Batman shooting resonates strongly with another DC Comics hero: Superman. 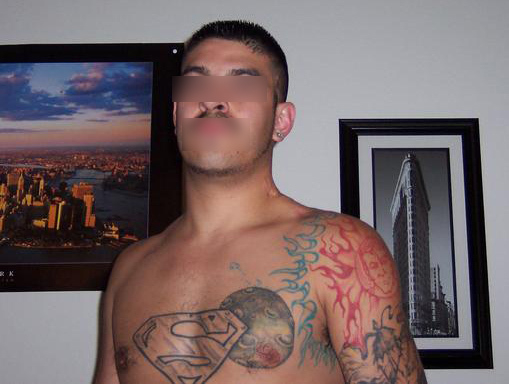 In addition to having the Superman symbol tattooed on his chest, Archuleta used the name "The 5uper" on his Myspace page (where he posted the result of his "Which Superhero am I" quiz: "You are Superman.") According to his Twitter, he was "working and spreading the Word" at the fortreSS of Sol!tude Upper Art Stud!o. I am guessing, given Archuleta's obvious fascination with Superman, that the tattoo on his upper arm (which I at first thought might be a poorly executed depiction of Elvis) is the face of Superman. The heavily cratered planet, with what appears to be a rocket taking off from its surface, is likely Superman's home planet Krypton, from which the infant Superman escaped in a spaceship. Of course, the appearance of sunlight is reflected in the name of the city – Aurora means dawn. A photo behind Archuleta shows a city (New York, I believe) experiencing a red sunset or a red dawn. Don't forget that Archuleta resonates with "Archuleta Mesa", the alleged location of the Dulce unferground UFO base located in the border between Colorado and New Mexico. Notice the 1/05 as 10,5 on the FOOTBALL JERSEYs in TDKR images you included from my blog?? Hillary Clinton receives a Blue Jersey with "112" and Football Helmet. "SANDY HOOK" = 112 in simple gematria. Hillary got the Jersey on 1/7/13 as is supposed to testify on the 9/11 Benghazi safe house incident in LIBYA. 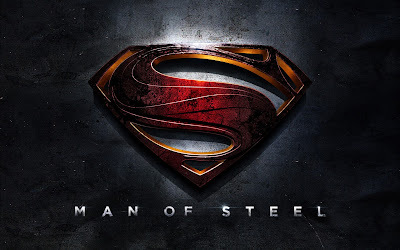 An obvious link between Batman and Superman is the involvement of Cristopher Nolan in both the Dark Knight films and the upcoming Man of Steel. Both the Dark Knight movies and the various Superman adaptations have associated "curses," as well. The number of days from the Aurora theater shootings to the most recent Aurora shooting tragedy was 169 ("unlucky" 13 squared). Death is traditionally the thirteenth trump in the Tarot's major arcana. Superman resonates with the sun, and perhaps Batman (the grim avenger of the night) can be thought of as a lunar resonator. The Marvel universe has a character, Moon Knight, who resembles Batman in many ways. Check Sunny's LinkedIn page, he listed himself as an artist for a Steele company. Check his myspace and he has a picture of his Harley, a special 100th edition of an all Steele bike. His obsession with Superman + the Steele references = Superman Man of Steele. As to the Flatiron building, seen in the photo behind the killer: The building sits on a triangular island-block formed by Fifth Avenue, Broadway and East 22nd Street, with 23rd Street grazing the triangle's northern (uptown) peak.